Size: 24" dia. x 1 3/8" d.
Medium and Materials: Encaustic on wood panel with custom circular hanging system. This is painting is part of my Reverie series which features a series of abstract nature-inspired paintings about the interrelationship between spirituality and the environment. Inspired by my walks around Toronto Island, each painting delves into concepts of liminality and revelation. These circular paintings celebrate the moments before wonder takes hold; when the breath is held just before its release; when the clouds shift and the light breaks through; when you touch the light within. Size: 30" dia. x 1 3/8" d.
This is painting is part of my Reverie series which features a series of abstract nature-inspired paintings about the interrelationship between spirituality and the environment. This painting was inspired by a walk along a frozen beach in February. Size: 20" dia. x 1 3/8" d.
Medium and Materials: Encaustic paint and metallic oil pastels on wood panel with custom circular hanging system. Awakening from a pleasant sleep and the lingering softness of a dream. This is painting is part of my Reverie series which features a series of abstract nature-inspired paintings about the interrelationship between spirituality and the environment. Inspired by my walks around Toronto Island, each painting delves into concepts of liminality and revelation. Taking a step into the depths. This is painting is part of my Reverie series which features a series of abstract nature-inspired paintings about the interrelationship between spirituality and the environment. This particular painting was a moment of deep release for me during an Imbolc retreat on the island. Size: 36" dia. x 1 3/8" d.
Rowena Katigbak’s Reverie is about the connection and interaction between spirituality and the environment. Inspired by her walks around Toronto Island, each painting delves into concepts of liminality and revelation. 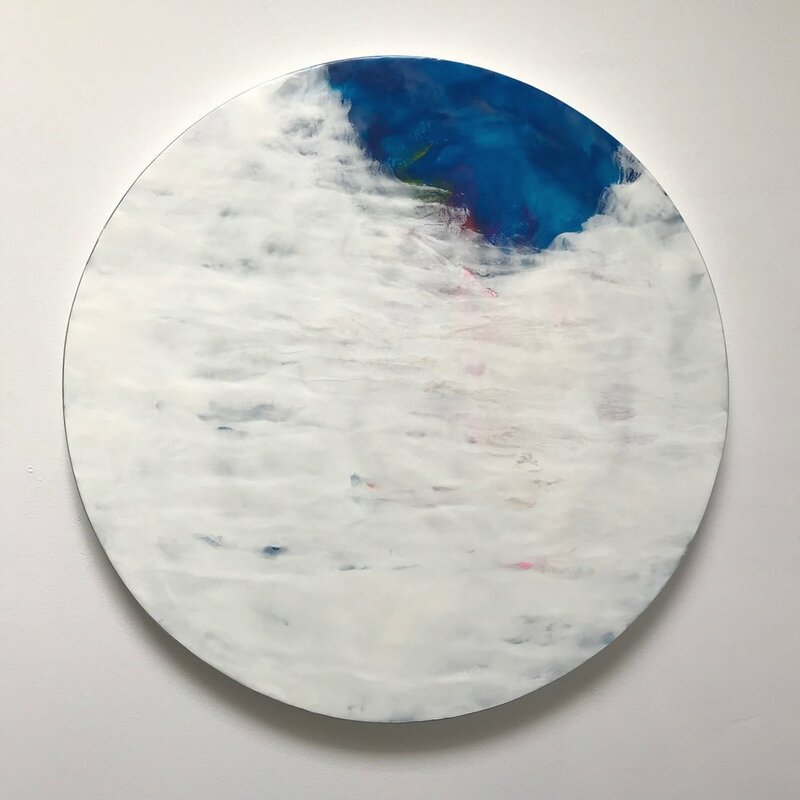 These circular paintings celebrate the moments before wonder takes hold; when the breath is held just before its release; when the clouds shift and the light breaks through; when you touch the light within. Size: 5.5” l. x 28” h. x 5.5” w.
This piece was exhibited at the Witchfest North Grimoires: Storytelling & Witchcraft Art Exhibition (Beaver Hall Gallery, Toronto, ON) from October 24-29, 2018. It’s part of a series that I’m working on called Progress. This series will be exhibited at the Neilson Park Creative Centre from Dec. 4-21, 2019. Here’s a brief excerpt from my project description. “Progress uses interactive kinetic sculptures based on automatons and toys to engage viewers. Their perspectives shift from spectator to participant. They are controlling the mechanism which drives the work. They are becoming empowered through play. For example, my sculpture “High Flyer,” from this series, involves turning a crank to make a witch fly around small patriarchal figures stuck on stone monuments. She is whimsical, free and gleeful as she swirls above them while they remain fixed in place. She is urging us to take our power back, to rise above and laugh at the absurdity of antiquated patriarchal thinking. Size: 14" dia. x 3/4" d.
This painting is part of my Arctic Flow Series which seeks to highlight the beauty of our glaciers, issues of climate change, and the need for ocean conservation. The title, Polynya, refers to a stretch of open water surrounded by ice. It's essentially an oasis of water for Arctic creatures such as the eider ducks who live in the Arctic all year round. Eider ducks depend on these open water holes to access sea urchins and mussels in the frigid waters during winter months. Size: 9' w. x 12' h.. x 1" d.
This painting is part of my Arctic Flow series which is an exploration of climate change and its effects on glaciers. Size: 6-1/2" dia. x 7/8" d.
Medium and Materials: Encaustic paints on baltic birch panel with custom circular hanging system. This was a second attempt at capturing the flow of water and snow melting away. I love the movement within this piece. This is a quieter piece. It's a dream surrounded by clouds and moonlight. Size: 6" w. x 9" h. x 1/2" d.
Medium and Materials: Encaustic paint and oil paint on wood panel with custom circular hanging system. Swirling currents of melting ice. A glimpse of deep water. Size: 6" w. x 8" h. x 1-1/2" d.
Medium and Materials: Encaustic paint, tempera paint, and oil pastels on cradled wood panel.